The 'Show me Tell me' questions. For my pupils coming up to test, as we have discussed here is the list of all the possible 'Show Me Tell Me' questions, you'll need to operate the control for the 'Show Me' question whilst on the move (you'll only be asked 1 from the list), also shown below is an appropriate answer to all the 'Tell Me' questions, only 1 of which will be asked at the start of the test. 1. When it’s safe to do so, can you show me how you wash and clean the rear windscreen? 2. When it’s safe to do so, can you show me how you wash and clean the front windscreen? 3. When it’s safe to do so, can you show me how you’d switch on your dipped headlights? 4. When it’s safe to do so, can you show me how you’d set the rear demister? 5. When it’s safe to do so, can you show me how you’d operate the horn? 6. When it’s safe to do so, can you show me how you’d demist the front windscreen? 7. When it’s safe to do so, can you show me how you’d open and close the side window? Brake pedal can be repeatedly pressed 3 or 4 times with the engine off, the brake pedal then becomes firm. Whilst still applying a little pressure to the footbrake start the engine, a slight but noticeable softening of the pedal should be felt indicating the servo is engaged. Brakes could be tested as you set off, as long as it's safe a little pressure applied to the footbrake once the car is moving should show an expected slowing with no deviation to the left or right. Correct tyre pressure's can be found in the car owners handbook. Use a reliable tyre pressure gauge to check the pressures, normally when tyres are cold (don't forget to check the spare tyre and remember to refit valve caps once checked). Tyres can normally be checked and inflated using a foot pump, mini compressor or at most petrol stations using the public air dispenser, some air dispenser's are free but most require a minimal charge for a set period of use. Tyre pressure on my car is around 30lb per square inch (PSI) or 2 bar. The head restraint should be adjusted so the rigid part of the head restraint is at least as high as the eye or top of the ears, and as close to the back of the head as is comfortable. 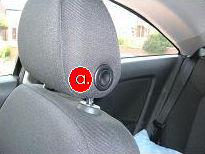 The control for adjusting the head restraint is pictured left 'a.'. 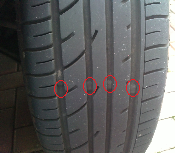 Explain that the legal tyre tread depth is 1.6mm and that on most modern tyres, tread wear indicators are placed within the main treads of the tyre (highlighted red on the diagram right), when the general tread of the tyre becomes level with the tread wear indicators then the tyre should be replaced. Your tyre should also have no cuts or bulges in the outer tyre walls, and the 1.6mm of tread depth should extend across the central 3/4 of the breadth of the tyre and around the entire outer circumference of the tyre, and that 3mm tread depth is advisable in winter. Tell me how you would check that the headlights and tail lights are working. (No need to exit vehicle). Operate switch located under the air vent on the right-hand side of the dashboard by rotating the circular switch shown on the right 2 clicks clockwise (engine electrics need to be on also). When the electrics are turned on the ABS warning light should illuminate on the dashboard, if there is no fault with the Anti-Lock Braking System the light will go out. The ABS warning symbol is shown to the right. Explain that you'd get all the indicators to flash by pressing the hazard warning triangle switch (pictured left) and check the functioning of all indicator bulbs, front, back and sides. Explain that you'd operate brake pedal, make use of reflections in windows, garage doors, etc, or ask someone to help. Tell me how you'd check that the power assisted steering is working before starting a journey. Tell me how you'd switch on the rear fog light(s) and explain when you would use it/them. (No need to exit vehicle). Turn on the headlights by turning circular light switch (shown left) 2 clicks clockwise (engine electrics need to be on also), and then press the two buttons shown in the centre of the switch, the top switch operates the front fog lights and the bottom switch operates the rear fog lights (fog light icons will then appear on the dashboard). Explain that the fog lights should be turned on when visibility drops below 100 metres. Tell me how you switch your headlight from dipped to main beam and explain how you would know the main beam is on whilst inside the car. Main beam control is on the indicator arm, to operate, the headlights and ignition must be on, then push indicator arm away from yourself. Blue main beam warning light shown right will appear on dashboard. 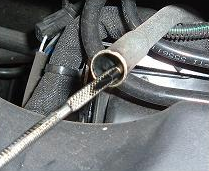 Identify dipstick / oil level indicator, explain how the dipstick is removed, cleaned, replaced and removed again and the oil level should be checked against the minimum/maximum markers or the shaded area. 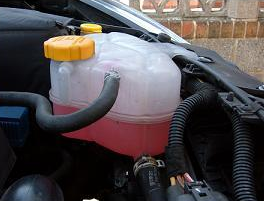 Open the bonnet, identify where the brake fluid reservoir is (see under bonnet at top of page) and tell me how you would check that you have a safe level of hydraulic fluid. 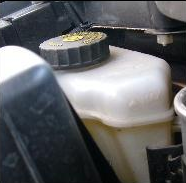 Identify the hydraulic fluid reservoir pictured right and check the fluid level against min/max markers on the side of the container. Providing competitively priced and top quality driving schools, delivering lessons in Garforth | Aberford | Allerton Bywater | Barwick in Elmet | Colton | Crossgates | Fairburn | Halton | Kippax | Ledsham | Ledston | Micklefield | Rothwell | Roundhay | Scholes | Seacroft | Swillington | Whitkirk | Woodlesford.